It may be slow, but it is moving. The National Bureau of Investigation (NBI) has asked the Ombudsman Conchita Carpio-Morales to file technical malversation and graft case against former president Benigno “Noynoy” Aquino 3rd and around 18 of his government officials over the controversial purchase of anti-dengue vaccine that was later deemed unsafe. The NBI said that Aquino approved the realignment and eventually released the P3.5 billion budget for the anti-Dengue vaccine on December 15, 2015 from Miscellaneous and Personnel Benefits Fund. The said move by Aquino and his officials were illegal since the immunization project was not part of the 2015 national budget says the NBI. Aside from the former president, complaint was also filed against two former health secretaries Janette Garin and Paulyn Ubial, former budget chief Florencio “Butch” Abad and 15 other government officials who found liable in the allegedly anomalous project. The case was released to the media on Monday but was actually filed on July 13. “We submitted a one-inch thick document and the ball is now in the court of the ombudsman. The filing of charges was in line with the Department of Justice (DOJ)’s findings following the creation of a panel of prosecutors tasked to investigate the case,” a Philstar source said. In 2017, DOJ created a panel to handle the complaints against Aquino and his co-respondents. On Monday, another criminal case was filed against Garin and 36 respondents in connection with the Dengvaxia anomaly. The said complaint was said to have been filed by the family of 11-year old Michael Tablate of Subic, who died in October after receiving the anti-Dengue vaccine. 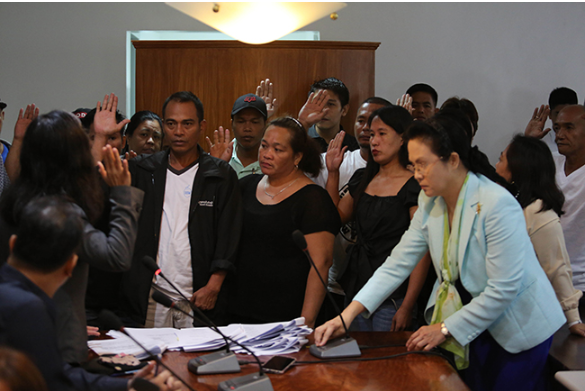 The family charged the respondents with reckless imprudence resulting in homicide and violation of the Anti-Torture Act and Consumer Act. The mother of Tablate, Rowena Villegas sought the help of the Public Attorney’s Office (PAO), the agency tasked by DOJ to investigate cases related to Dengvaxia – there were 67 documented cases allegedly due to the vaccine. To date, Tablate’s case is the 11th criminal complaint against Garin and others involved. PAO said that just like the previous complaints, Garin and respondents failed to inform the parents on Dengvaxia’s risk. Further, the health agency also failed to properly screen and monitor the children as the vaccine posed a risk to receivers who have not yet contracted dengue. “Around a week after receiving his last shot of Dengvaxia, Michael suffered from dizziness, headache and vomiting causing him to miss school. He also started having asthma attacks,” Villegas’ complaint stated.